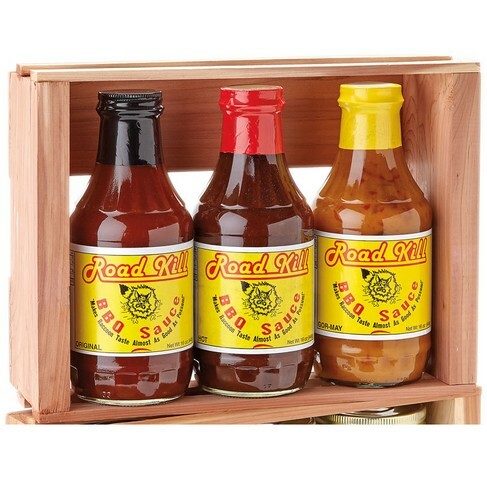 RoadKill BBQ Sauce Gift Set, Gift Sets: Southern Flavoring Company, Inc.
Fuuny name - serious sauce! Our RoadKill BBQ Sauce Gift Crate is sure to please both the serious and fair-weather griller. Original, Hot and Gor-May are all in this unique gift set. Contains three 16-oz bottles in a reusable gift crate. Discounted price when you buy 3 to 6 of the same gift sets. For more than 6 of any gift set, please call 800-765-8565 for personalized service.